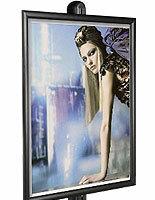 These snap open frames stand 8 feet tall! 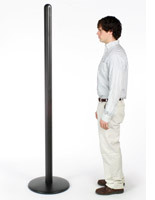 This sign stand display towers at 94" tall, attracting attention to your message! Two height adjustable snap open poster frames with two literature trays make this sign an incredibly versatile promotional tool. This sign stand display is an effective marketing mechanism! 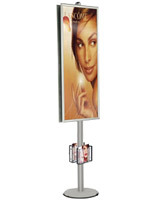 The sign stand display, also known as a poster holder, is 94" tall to attract attention! 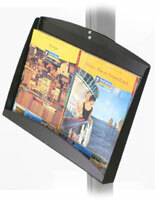 Dual viewable sign frames enable great traffic coverage with one advertising stand. Simple but very versatile, this sign holder is built strong and durable.The 8 ft height of this sign stand display dictates that it is best used in large indoor venues with high foot traffic or crowded conditions. 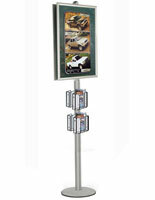 These sign stand display items are most popular in large retail store, mall and lobby areas. This sign stand display uses snap open poster frames. 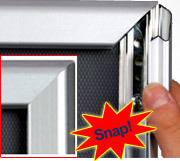 Snap frames are great for frequent graphic or sign changes. Just pop open the frame sides and place the graphics underneath the clear plastic lens and close the frame sides. Clear lenses are provided to protect the printed materials and are non-reflective. The two acrylic literature holders are 9-1/4"w x 2-1/4"d x 8-1/4"h pockets to comfortably accommodate 8-1/2"w x 11"h print materials. 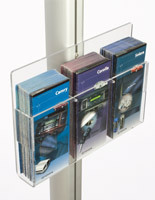 The snap frame and acrylic holder is attached to the sign stand display pole with connector panels and screws. Height adjustments are simply controlled by the connector panel screws. This sign holder unit ships unassembled and is put together quickly and easily with the instructions provided.